On Line Bill Pay – You can fill out your information to be ready. Payments may be made by mail, in person or over the phone during business hours. 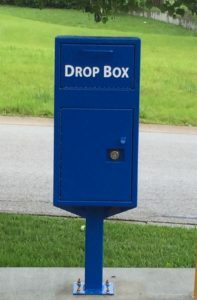 A drop box is conveniently located on the front of our office for after hours payments. Meters are read generally between the 22nd and 25th of each month. Bills are sent out by the 5th of each month, and are due upon receipt and become delinquent after the 20th. Bills not paid by the 21st receive a 10% late charge. Bills not paid 10 days after being delinquent are assessed a $5.00 collection fee and are subject to shut-off. If service is terminated, a re-connection charge is added and must be paid before service can be reconnected. If you have not received a Bill by the 5th of the month you should call the office. We are not responsible for lost bills.